Each bin of fresh cod fish is brought up from the fishing boats and placed on the scales on the dock in the harbour of Trout River in Gros Morne National Park in Newfoundland, Canada. Here the fish are paid for according to weight and this fisherman appears to have had a good day after filling three binfuls. Fresh Cod Fish on the dock in the harbour at Trout River, Gros Morne National Park, UNESCO World Heritage Site, Viking Trail, Trails to the Vikings, Highway 431, Northern Peninsula, Great Northern Peninsula, Newfoundland Labrador, Newfoundland, Canada. 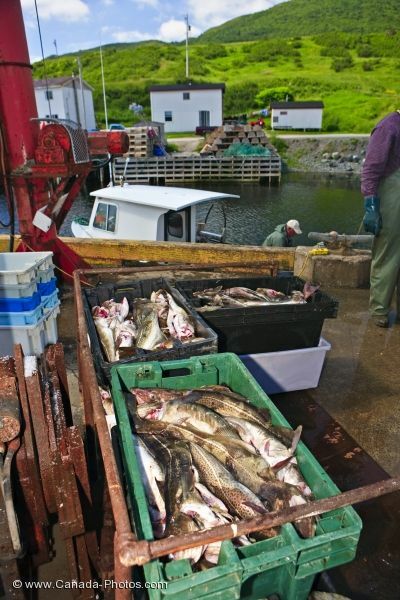 Picture of fresh cod fish in bins along the dock of Trout River in Newfoundland, Canada.